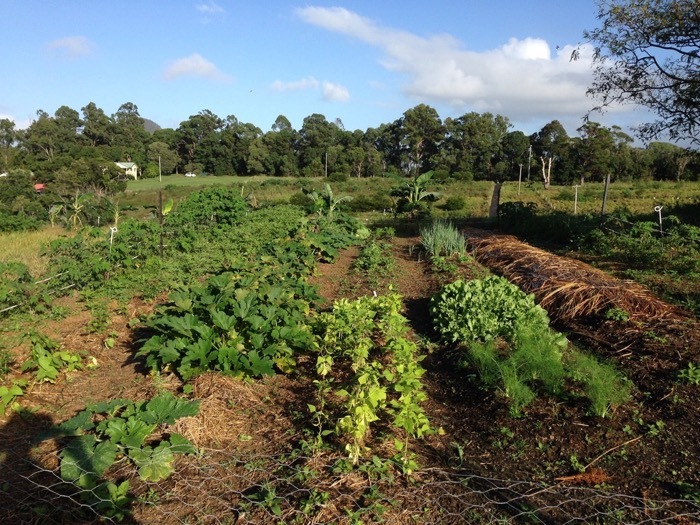 At its heart permaculture is a design oriented philosophy. When we go through the design process we normally take note of the local landforms and resources as if they are a blank page to which we then add the elements that we desire. In order to try and maximise our chances of getting a favourable outcome we invest time in researching and thinking about the possible elements and their organisation in order to decide what resources to invest in making the dream a reality. This top down, aspirational way of approaching design can fail to work in a multitude of different ways, or fail to be maintained for long enough to reach its full potential. This approach to design I like to think of as being positive design – the act of adding to and building up the world around us. Goats grazing Tithonia established from unrooted cuttings less than a year ago, a relatively weak form of positive design. Humans by our animal nature are not naturally positive influences in the landscape. Animals are best at consuming and disrupting the world around them – think how much easier and faster it is to cut down a tree compared to growing one. Plants are the builders in the ecosystem and it is only very recently in human history that we have learned to cooperate with them to co-create (and to be honest we are still not very good at it even after about five thousand years of practice). For humans at least it seems one of the most natural things for us to do is to behave in previously unnatural ways. When humans attempt to apply positive design to the landscape we find it involves enormous investments of time, energy and resources and high levels of risk. Until recently in history the vast majority of the population had to devote most of their lives to growing food by imposing positive design on the landscape and yet still live in constant fear of crop failure and famine. Fossil fuels dramatically changed this balance but their utility will run out one day. Trees propagated in tubes then transplanted into tree guards, a more positive design approach that required more resources, with more restricted scale. The obvious flip side to positive design is negative design. This approach is more in sync with the natural strengths of human animals and focuses more on shaping the environment by cutting out unwanted elements rather than creating wanted ones. For example negative design would involve taking a natural forest and selectively cutting down trees to create a pasture for animals. Woody plants could be left strategically to create hedges, wind breaks and shade zones. Pasture species would arise spontaneously in the disturbed spaces and would not need to be deliberately imposed by human efforts. The positive approach would be starting with relatively bare ground then introducing new pasture species to improve forage quality (often requiring added seed, minerals, possibly using machines for sowing), growing trees and hedges in pots then transplanting into tree guards with fertiliser and irrigation to support them. The former approach describes the successful spread of agriculture across the planet. The latter approach describes the mostly unprofitable behaviour of humans acting with the assistance of abundant fossil fuels. In today’s world the approach of negative design is limited by the lack of plant material to cut away to shape the landscape, while positive design is limited by the limited amount of resources available for humans to direct. 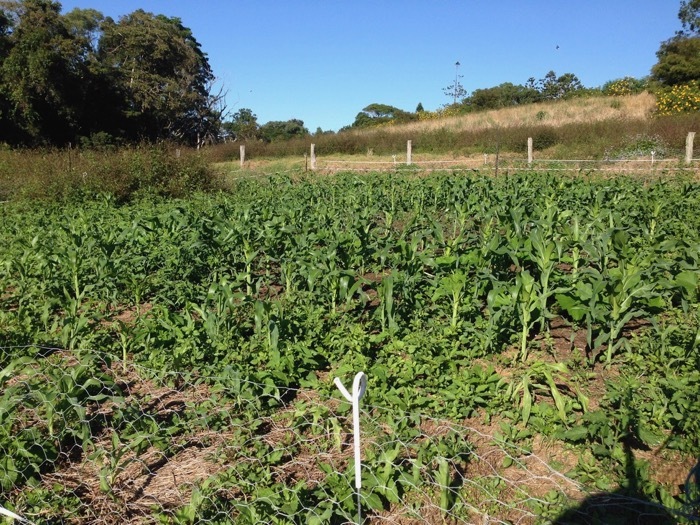 A more positive design approach where geese create a disturbed space with concentrated nutrients, allowing the maize to get a head start on the weeds. This space isn’t weeded, only harvested when ready. The final way of looking at how people can approach the landscape is the idea of neutral design. This is similar to Fukuoka’s principle of “do nothing”. Choosing to do nothing is an essential element of the design toolkit (usually accompanied by ongoing observation). Much of the eventual economic recovery after the fall of the Roman Empire can be linked to regrowth of forest resources and restoration of soil fertility by abandonment of fields. For example, looking around my own property that I have been planting at every opportunity for the last decade I estimate less than 5% of the plant biomass is from things I have planted myself- the ecosystem, including those parts most useful to me, grew and evolved on their own. The way that 95% of my biomass has developed has been influenced a lot by my own decisions and the actions of my livestock but most of the positive changes occurred without my deliberate intentions. Species composition has changed to increase photosynthesis as much as possible, including a shift to nominally weedy species that have nevertheless proven to be more useful than the species they replaced. My most positively designed space that requires regular inputs of goat manure, hand weeding and resowing of seasonal crops. 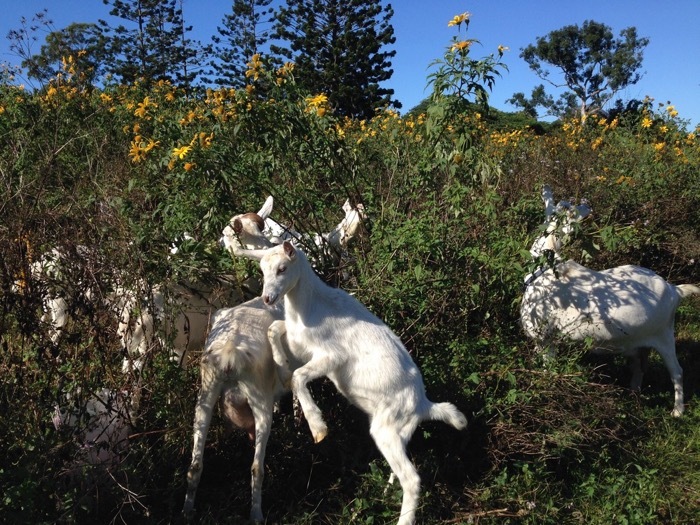 If I had to buy the goat manure the profitability of this venture would be marginal. The high input demand of this space greatly limits the scale of this approach. These three design mindsets are not absolutes. Instead they exist on a continuous spectrum from extremely positive approaches to extremely negative ones. For example when growing food crops at the most positive end would be hydroponics, then greenhouse cultivation, then a vegetable patch with added irrigation and fertiliser, then hardy field crops that only need moderate disturbance such as penned livestock, and finally to wild edibles that only need broad ecosystem management (for example periodic burning on the more destructive end). For growing trees at the positive end would involve transplanting a mature tree and supporting it physically, to transplanting a small tree in a tree guard, to direct sowing, to scattering seed, to naturally seeding trees (again often needing some negative disturbance). For raising animals the extreme positive end might be lab grown meat, then a battery hen, then ranged beef provided pumped bore water and vaccinations, to managed wild bison, finally to completely wild animals maintained with controlled hunting. To me the most successful approach lies in using the most weakly positive approaches to enhancing plant growth to maximise the effectiveness of limited resources, then applying negative design to shape the vegetation across the landscape. 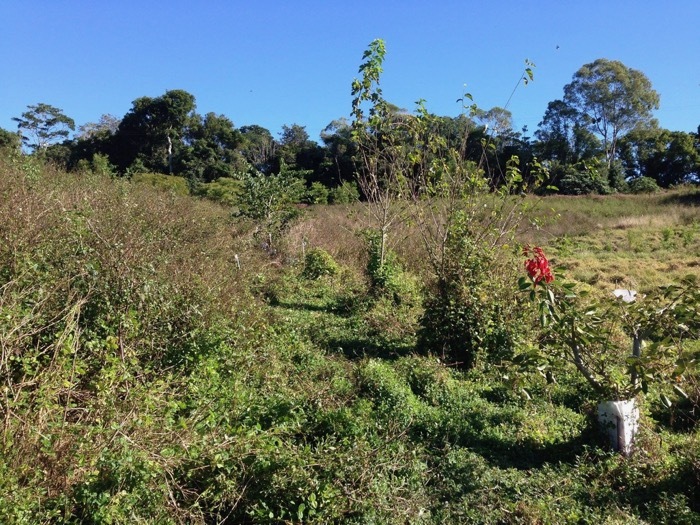 For example I started establishing fodder trees and shrubs on my property by growing seedlings in tube pots then transplanting them into tree guards when quite small into the exact spot that worked around my cattle rotational grazing. With some species I found I could directly plant unrooted cuttings, reducing the amount of work per plant and allowing me to establish larger pioneer plant stands. These early plantings allowed other species to be direct sowed in their shade, reducing resources for growing and transplanting and allowing more plants to be established with the available resources. I was initially concerned about some of these pioneer species spreading everywhere and getting “out of control”. I have now seen how much my goats love eating them, and realised how long it will take me to plant enough of them even by direct cuttings, so I have shifted to scattering their seed over large tracts of the property. Rather than relying on positive design to put them exactly where I want them I decided to embrace negative design, allowing them to spread more widely then using the energy saved planting them to instead remove them where I don’t want them, for example to maintain open walk ways. Seedlings are easily hand pulled up to about six months of age. The more weakly positive approaches of plant establishment has a hidden benefit- plants often want to grow in one place but not another, and just reading about their preferences in a book is never enough to figure this out in advance. By scattering seed widely you allow plants to grow where they grow best. You can then apply negative selection to balance the diversity or refine the positioning as needed. A similar benefit can be realised if direct sowing where each tiny hole you dig gets a wide range of seed planted in it, and whichever plant grows best claims the space. Similarly multiple tree tubes can be planted in one hole, though the resources invested in each tube is a lot higher. This new mindset is allowing me to see the landscape and how I relate to it differently and hopefully make better design decisions going forward. Note from Dan: I happened across this post on facebook by Shane a few days back (thanks to Meg McCowan for alerting me to it). It is always a treat to find fellow permaculturalists reflecting on their practical experiences with design process and developing new distinctions therein. Thanks to Shane for permission to repost his words and photos here. I look forward to seeing your comments below. Really enjoying these posts Dan. I’ve just done my PDC with Nick Ritar in Bali and although haven’t got any design experience am enjoying these more in depth articles about the process. It required some reflection on my behalf to absorb the underlying value of Shane’s three-part classification. Better still when I saw beyond the troika to understand it as one long spectrum of choices it gained even more potency. Asking the right question up front is worth the effort because it reveals alternatives. Like not doing. Or only doing a bit. Lao Tzu would nod in approval. Useful Shane (and Dan): thank you. Differentiation just means to make different. Whether you use the word differentiate, transform, make different, change, modify, reconfigure, etc etc, the upshot is any process of design and/or creation is a sequence of [insert your preferred word here]. Each of these changes might involve addition (I bring home an apple tree to plant), multiplication (I decide to times that by ten), subtraction (I get rid of the rose bush), division (I partition the yard into two terraces), or morphing or merging or otherwise rearranging what is already there, or any number of other change types. In all cases you have differentiated the whole you are working with. You have made it different. In most cases, each change or differentiation simultaneously involves many of these things. I divide a room in two by adding and assembling some bits of wood and screws. And so on. The take away point is that we tend in our culture to display an unconscious bias in our designing and creating toward adding/assembly, when this is not only missing most of the tool box, but it is out of alignment with the fact that in nature things tend to grow where addition/assembly is an underling of division (e.g., in order for a cell to divide various molecules etc must come in from outside the system, and, sure, if you like, be assembled). It is also going to get harder and harder to do in an energy decent future. But most importantly, it is not the whole shebang. Hopefully over time we’ll all enlarge the vocabulary with which we describe the changes going on inside permaculture design process (where a problematically strong bias toward addition/assembly has been evident).